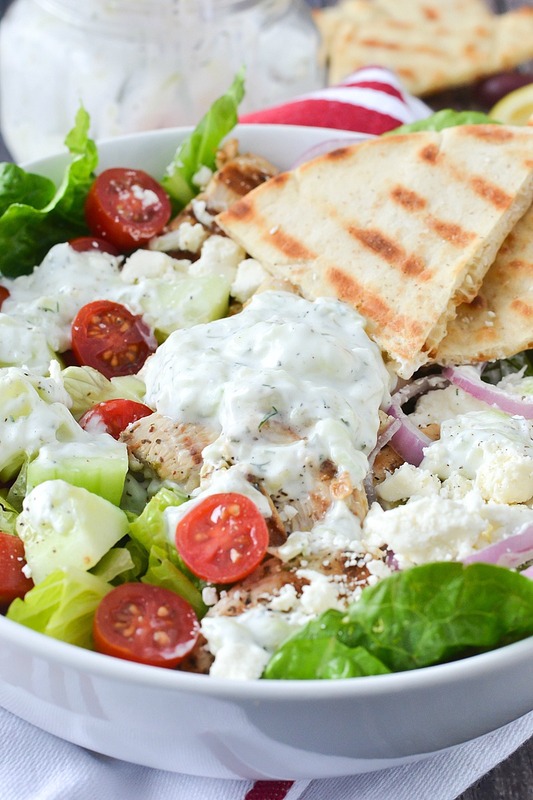 Everything you love about chicken gyros tossed in a loaded Chicken Gyro Salad and topped with a delicious Creamy Tzatziki Dressing! I absolutely love a good gyro! They’re so messy to eat but they’re so darn good! I love them on a warm thick pita stuffed with meat, tomatoes, cucumber, onions, feta cheese and topped with my favorite, the creamy Tzatziki sauce! I took all the delicious components of a chicken gyro and turned it into an super tasty loaded chicken gyro salad. 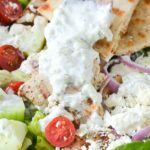 It’s got everything you find in a gyro tossed in a delicious salad and topped with a Creamy Tzatziki Dressing you’ll want to drizzle on everything! I love to serve this salad with warm wedges of pita bread that you can serve on the side or up and toss with the salad. 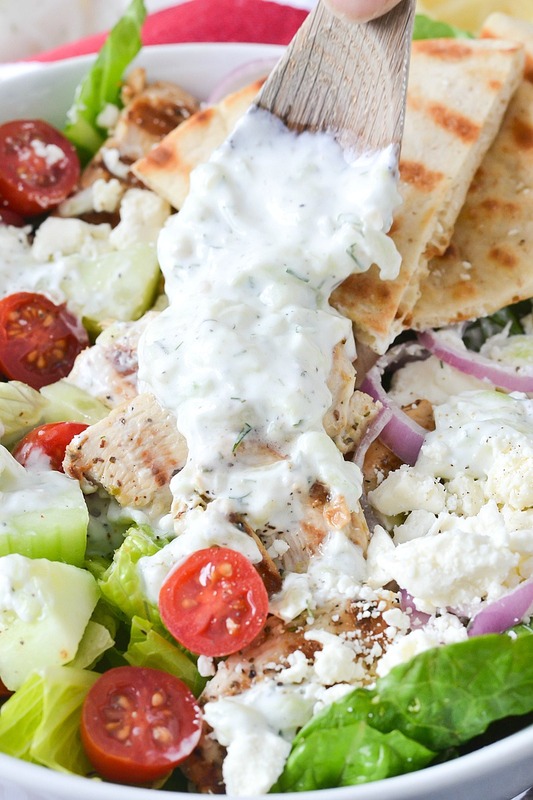 If you love chicken gyros then you’ll also love this tasty salad! 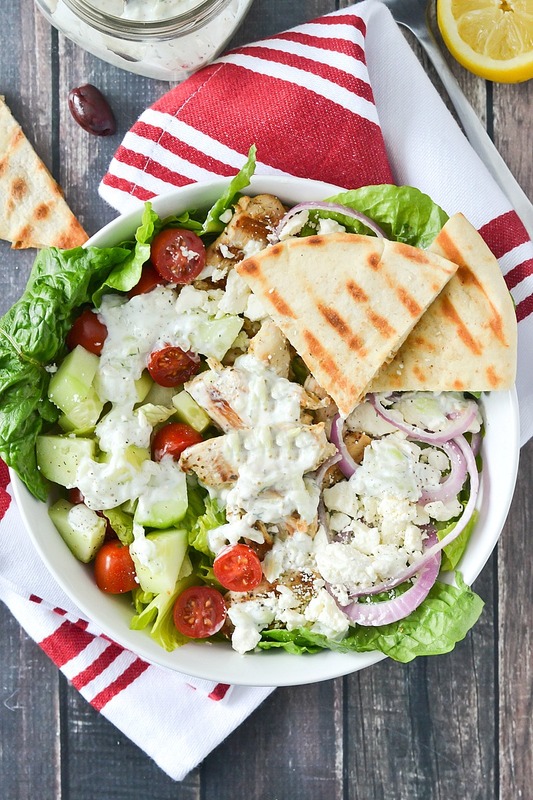 For this salad you can either use my suggested Greek Chicken recipe but to save time you could definitely grab a store bought lemon pepper rotisserie chicken, slice it up and use in the salad too. I’ve made it both ways and either way it’s really good. 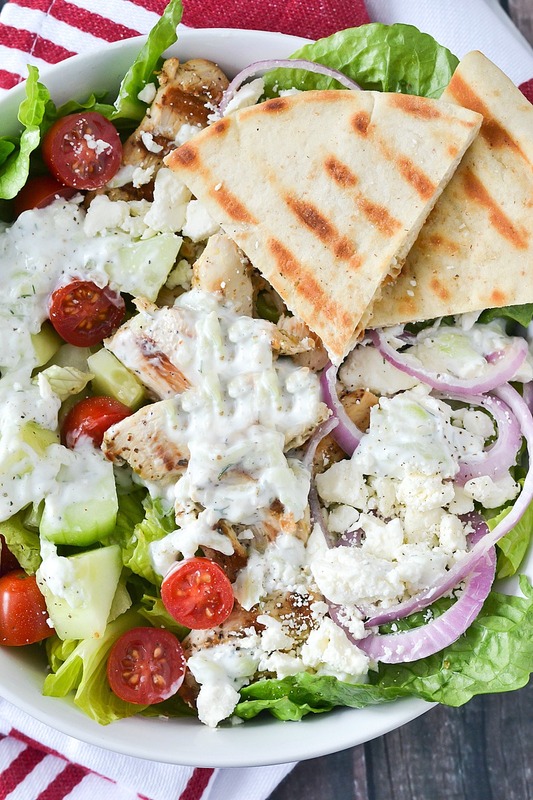 The star of this recipe is really the Creamy Tzatziki Dressing. It’s got everything you find in Tzatziki sauce like shredded cucumbers, plain greek yogurt and a little dill but it’s thinned out just a little with some milk so it’s not as thick and more like a dressing. You can make the dressing ahead of time, store it in a mason jar. When ready to serve give it a good shake and drizzle it on this salad and dig in! Place chicken in a gallon size resealable bag. In a small bowl mix together lemon zest and juice, garlic, olive oil, oregano, salt and pepper. Pour marinade over chicken and marinate for a few hours or overnight. When ready to cook heat a large grill pan over medium high heat. Remove chicken from marinade and discard bag. Add chicken to pan and cook about 8 minutes per side until throughly cooked. Transfer chicken to a cutting board and slice on a diagonal then set aside. Peel and shred cucumber using a grater. Place shredded cucumber in a colander or kitchen towel and press all the juices out. Place shredded cucumber in a bowl along with yogurt, 1/3 cup milk, dill, vinegar, garlic powder, salt, pepper or lemon pepper seasoning and mix until combined. Add additional milk if desired. Place dressing in a mason jar. Cover and refrigerate until ready to serve. Shake dressing well before serving. To assemble salad, place chopped lettuce in a large bowl. Top with tomatoes, cucumber, onion and feta and top with sliced chicken. You can save time using a store bought lemon pepper rotisserie chicken. Make dressing ahead of time. Dressing will last up to a week. We use Fage Greek yogurt for this recipe.